The Royal Danish Embassy's nine-city COP15 Cycling Tour of Japan, which I was a part of last month wrapped up this week. The final stage of the Kyoto to Copenhagen cycling tour was in... well... Copenhagen. The Danish ambassador to Japan invited the Japanese ambassador to Denmark for a little 13 km bicycle ride last Sunday. We were about 200 people all in all and the woman in the photo was present, too. That's Connie Hedegaard, the Danish Minister for Climate and Energy and she must easily be the hardest working politician in Denmark this year. She is constantly travelling to world capitals to drum up support for signing the Copenhagen agreement at the Climate Conference in December 2009, here in the Danish capital. 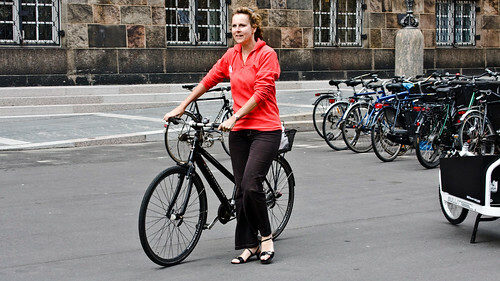 I was pleased to see that she chose to wear typical Copenhagen cycling gear for the ride. Regular clothes on a basic bike. Nice, one Connie. A really lame photo... I was too busy zipping up and down the pelaton talking to friends to take any decent shots of the crowd. It was actually cool to have police motorbikes escorting us the whole way. Pedalling casually through red lights is cool when it's state-sponsored. Here's Connie getting a present from the Japanese ambassador outside the Danish Parliament, where the ride ended for a reception in the gardens.